For the second in the X-Men identity series, we look at another factor of identity—alignment. Anyone who’s ever played roleplaying games is aware of alignment: lawful vs. neutral vs. chaotic, and good vs. neutral vs. evil. In most all fiction, alignment (good guy vs. bad guy) plays a major part in the drama and climax of story. But, even more so in X-Men. The leader of the X-Men, Professor Charles Xavier, is training a group of young people with the mutual gene to do good in the world and use their powers for the benefit of society. On the other side, Magneto also leads a group of mutants to reclaim their power in the world—not for the benefit of society, but for their own benefit. Not exactly anti-society (which would be “evil” and seek to destroy society), but anti-establishment, seeking to change society and promote themselves. For these reasons, I see Xavier as lawful good (doing good for society), and Magneto as chaotic neutral (doing whatever it takes to promote themselves). These alignments define their purpose. 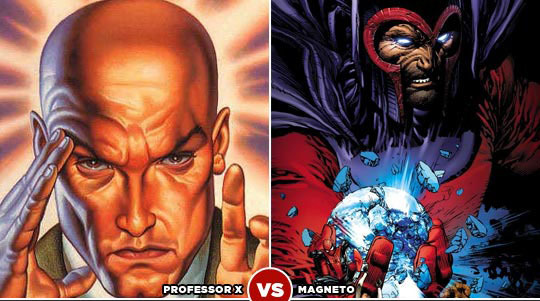 The alignment issues for Xavier and Magneto are a combination of their background (Charles: privileged, Magneto: tragic) and personality (Charles: assimilating, Magneto: rebellious). Nurture and nature combining in the choices they make that determine their character.